QUETTA (92 News) – Two commanders of a banned organization surrendered due to efforts of provincial minister Nawab Changez Khan Marri. Shikari Marri and Madina Marri laid down their weapons in a ceremony at the resident of Changez Khan Marri on Saturday. 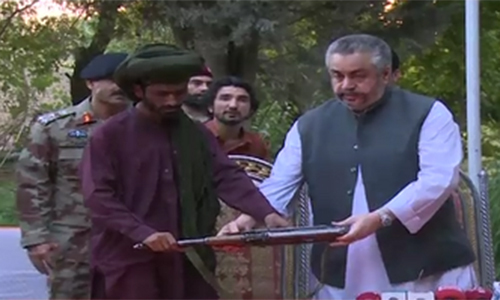 The ceremony was attended by Balochistan Home Minister Sarfraz Bugti and the IG FC. He said that the war against terrorism is going on across the country. The minister said that the PAF was not participating in any operation in Balochistan.